The City and project team recently completed design for the project. We encourage you to view the plans: read more about the final details, view the site plan map of the entire corridor (and the corresponding map legend), or download the detailed drawings for the project. The project will reconstruct the entire ten blocks of D Avenue from State Street to 10th Street, all within the existing public right-of-way. Additional improvements will also take place on portions of 1st Street, 7th Street, 8th Street, 9th Street and E Avenue. The design incorporates a much safer way for pedestrians to connect to schools, downtown businesses, the library and other services in the neighborhood. It also helps address significant stormwater issues and rebuilds old, deteriorated underground utilities in this area of the neighborhood. The City and project team has worked diligently to include neighbors and stakeholders in the design development and respond to requests or concerns. Two neighbor walking tours, two public open houses, numerous face-to-face meetings and extensive field work helped inform the designs of the project. Many neighbors are excited about the rain gardens, landscaping, sidewalk and overall roadway design. Thank you to all the neighbors who have participated, shared your thoughts, concerns and ideas on improvements for the project. We appreciate your willingness to be involved and have enjoyed working with each of you to develop the design. 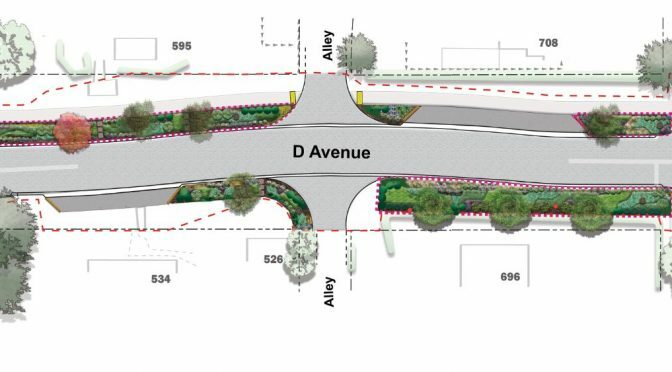 When construction is complete, the road and corridor along D Avenue will look different – the lanes for vehicles will be about the same width, but will have been shifted. 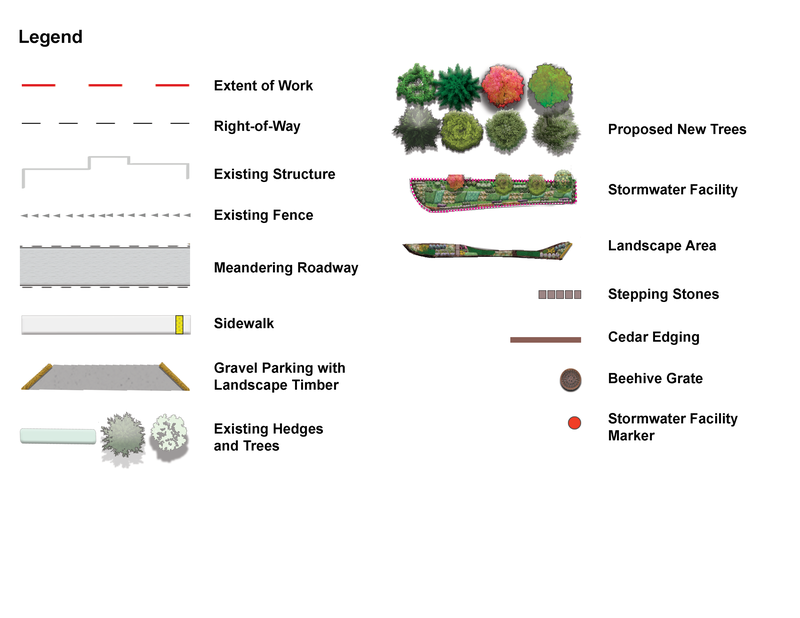 Portions of the road alignment will meander with slight curves to allow for a new sidewalk and about 40 rain garden areas necessary to manage and treat stormwater. 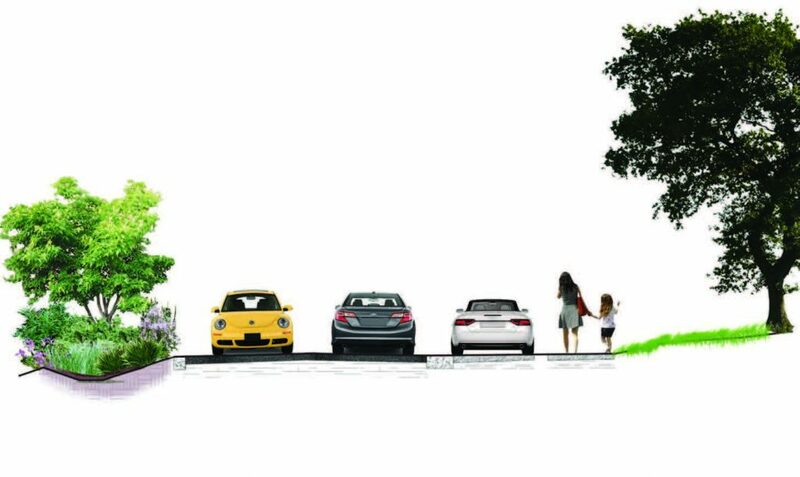 Parking areas will also be more clearly delineated within the public right-of way. If you are a property owner along D Avenue, please watch for a letter arriving in the coming days with information on the final design, a map of the improvements specific to the block on D Avenue where your property is located, and a factsheet about construction. With design now complete, the next phase will be construction. A “Meet the Contractor” meeting to introduce the contractor and share information about construction will be scheduled in the next month or so, before work begins. Stay tuned for more information on the meeting date and time. Major construction is set to begin this spring and take about a year or so to complete. Most of the intensive construction is expected to occur in summer 2018. Schedules are subject to change. Unfortunately, construction will be disruptive, especially to those nearest the work. The project includes stormwater and waterline installation, roadway demolition, roadway surface preparation and grading, concrete formwork, concrete placement, concrete curing, asphalt paving and significant landscape and irrigation work. This means crews will be in front of each property along D Avenue many times over the project duration. There will be intermittent lane closures, and at times, there will be full road closures. We appreciate all neighbors abiding by traffic control signage and avoiding active construction areas for the safety of all. If you have a special access need we should be aware of, please contact us. We will strive to keep neighbors aware of the ever-changing construction activities through our regular project updates. For more information about what to expect during construction, review the latest newsletter or contact the project team.